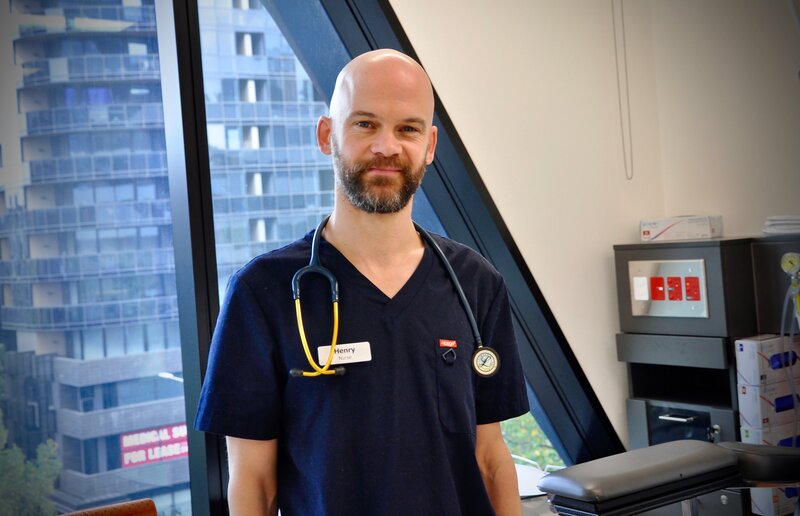 Henry Clark is a Nurse at the Peter MacCallum Cancer Centre. Once I decided to pursue nursing, I looked around for entry-to-practice courses that provided a high standard of training with good prospects for employment. I was delighted that the University of Melbourne offered a two year masters course, meaning I wouldn't have to go back to do another bachelors degree. They also boasted great connections with many major metropolitan hospitals and an exceptional record for getting their graduates placed in grad year programmes. I came to an information evening and felt an instant connection to the place and felt that this course would challenge and push me in a way I was ready for. I have lots of good memories of sitting in the Alan Gilbert Building with friends, studying for exams, and then debriefing in the pub with the same friends, when the exams were over! However, my fondest memory is of my final clinical placement in Nepal. One of the best moments was the excitement of meeting everyone for breakfast on the morning that we all got our Grad Year offers. It was so nice to share this experience with 7 other students who had all been through the same challenging two years. What goals did you set yourself when you finished University and have you stuck to that plan? I wanted to launch into my graduate year with the same work ethic and momentum that got me through my degree. A grad year is really a continuation of the education process and there are lots of opportunities and support available if you want to push yourself. As a Melbourne Nursing graduate I think you are set up with a knowledge base and critical thinking skills that can really help you make a strong start to your nursing career. I have stuck pretty well to this approach and have been able to make good headway in my first 6 months as a nurse. I had a very strong internal motivation both to become a good nurse and to push myself academically. Way back in 1999 when I started my undergraduate degree in the UK, I think I was more interested in socialising than challenging myself intellectually. This time around, I wanted to see what I could do if I really tried. I found plenty of other students who were of a similar mindset, and the teachers - a couple in particular - were so enthusiastic and dedicated that I felt I wanted to do well for them, too. The course is challenging and can be all-encompassing, but it's over in a flash and before you know it, you'll be nursing for real. Get your money's worth: make the most of the facilities, the expertise, the support, the connections you make. It may not feel like it at times, but you're in a great position, so savour it. The area I work in - Day Therapy - has never had a graduate nurse before, and I have never experienced this way of working, so I feel proud that I have been able to adapt and find my place here. Finding something approaching balance: meaningful and rewarding work balanced with the time and space to enjoy all the other interesting things that life has to offer.